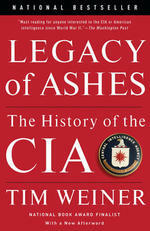 Legacy of Ashes is the record of the first sixty years of the Central Intelligence Agency. It describes how the most powerful country in the history of Western Civilization has failed to create a first-rate spy service. That failure constitutes a danger to the national security of the United States. The book is drawn from the words, the ideas, and the deeds set forth in the files of the American national-security establishment. They record what our leaders really said, really wanted, and really did when they projected power abroad. This book is based on my reading of more than fifty thousand documents, primarily from the archives of the CIA, the White House, and the State Department; more than two thousand oral histories of American intelligence officers, soldiers, and diplomats; and more than three hundred interviews conducted since 1987 with CIA officers and veterans, including ten directors of central intelligence. Extensive endnotes amplify the text. This book is on the record — no anonymous sources, no blind quotations, no hearsay. It is the first history of the CIA compiled entirely from firsthand reporting and primary documents. It is, by its nature, incomplete: no president, no director of central intelligence, and certainly no outsider can know everything about the agency. What I have written here is not the whole truth, but to the best of my ability, it is nothing but the truth. I hope it may serve as a warning. No republic in history has lasted longer than three hundred years, and this nation may not long endure as a great power unless it finds the eyes to see things as they are in the world. That was once the mission of the Central Intelligence Agency. Alone in the Oval Office on Monday, November 4, 1963, John F. Kennedy dictated a memo about a maelstrom he had set in motion half a world away — the assassination of an American ally, President Ngo Dinh Diem of South Vietnam. The CIA’s Lucien Conein was Kennedy’s spy among the mutinous generals who murdered Diem. “I was part and parcel of the whole conspiracy,” Conein said in an extraordinary testament years later. His nickname was Black Luigi, and he had the panache of a Corsican gangster. Conein had joined the OSS, trained with the British, and parachuted behind French lines. In 1945, he flew to Indochina to fight the Japanese; he was in Hanoi with Ho Chi Minh, and for a moment they were allies. He stayed on to become a charter member of the CIA. In 1954, he was one of the first American intelligence officers in Vietnam. After Ho defeated the French at the battle of Dien Bien Phu, Vietnam was partitioned into North and South at an international conference in Geneva, where the United States was represented by Undersecretary of State Walter Bedell Smith. Conein went to North Vietnam on sabotage missions, destroying trains and buses, contaminating fuel and oil, organizing two hundred Vietnamese commandos trained by the CIA, and burying weapons in the cemeteries of Hanoi. He then returned to Saigon to help shore up President Diem, a mystic Catholic in a Buddhist country whom the CIA provided with millions of dollars, a phalanx of bodyguards, and a direct line to Allen Dulles. The agency created South Vietnam’s political parties, trained its secret police, made its popular movies, and printed and peddled an astrological magazine predicting that the stars were in Diem’s favor. It was building a nation from the ground up. 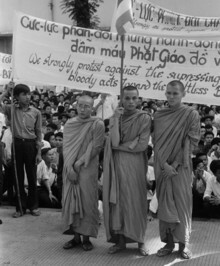 Buddhist monks hold signs protesting the religious policies of President Diem on August 18, 1963, in memorial services at Xa Loi Pagoda for Buddhists who committed suicide by burning as a demonstration against the government. Photo: © Bettmann/CORBISIn 1959, the peasant soldiers of North Vietnam began to carve the Ho Chi Minh Trail through the jungles of Laos; the footpaths were filled with guerrillas and spies heading for South Vietnam. Laos, a preindustrial lotus land, became “a flashpoint where the U.S. saw its interests being challenged by the communist world,” said John Gunther Dean, then a young State Department officer at the American embassy in Vientiane. The CIA set to work buying a new Lao government and building a guerrilla army to fight the communists and attack the trail. The North Vietnamese reacted by stepping up their attempts to infiltrate the country and train the local communists, the Pathet Lao. The CIA forced out a freely elected coalition government and installed a new prime minister, Prince Souvanna Phouma. The prime minister’s case officer was Campbell James, an heir to a railroad fortune who dressed, acted, and thought like a nineteenth-century British grenadier. Eight years out of Yale, he saw himself as a viceroy in Laos, and lived accordingly. James made friends and bought influence among the leaders of Laos at a private gambling club he created; its centerpiece was a roulette wheel borrowed from John Gunther Dean. In early January 1961, in the final days of the Eisenhower administration, the CIA’s pilots delivered their first weapons to the Hmong. Six months later, more than nine thousand hill tribesmen controlled by Vang Pao joined three hundred Thai commandos trained by Lair for combat operations against the communists. The CIA sent guns, money, radios, and airplanes to the Lao military in the capital and the tribal leaders in the mountains. Their most urgent mission was to cut the Ho Chi Minh Trail. Hanoi had now proclaimed a National Liberation Front in the south. That year, four thousand South Vietnamese officials died at the hands of the Vietcong. A few months after President Kennedy took power, the fates of Laos and South Vietnam were seen as one. Kennedy did not want to send American combat troops to die in those jungles. Instead, he called on the CIA to double its tribal forces in Laos and “make every possible effort to launch guerrilla operations in North Vietnam” with its Asian recruits. U.S. 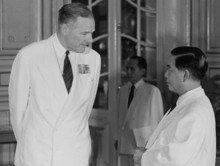 Ambassador Henry Cabot Lodge (left) presents credentials to President Diem at the Presidential Palace on August 26, 1963. Photo: © Bettmann/CORBISThe Americans sent to Vietnam had an equally profound ignorance of the country’s history and culture. But the CIA’s officers saw themselves as the point men in the global war on communism. What they lacked was intelligence about the enemy. That was the responsibility of William E. Colby, the station chief in Saigon from 1959 to 1961, soon to be chief of the Far East division of the clandestine service. “Doubled, played, terminated.” That last phrase suggests that the United States discovered that a commando team was secretly working for North Vietnam and then hunted and killed its members. The reason for the failure of the missions eluded the CIA until after the cold war, when one of Colby’s cohorts, Captain Do Van Tien, the deputy chief for Project Tiger, revealed that he had been a spy for Hanoi all along. In October 1961, President Kennedy sent General Maxwell Taylor to assess the situation. “South Vietnam is now undergoing an acute crisis of confidence,” Taylor warned in a top secret report to the president. The United States had to “demonstrate by deeds — not merely words — the American commitment seriously to help save Vietnam.” He wrote: “To be persuasive this commitment must include the sending to Vietnam of some U.S. military forces.” That was a very deep secret. To win the war, General Taylor continued, the United States needed more spies. In a secret annex to the report, the CIA’s deputy station chief in Saigon, David Smith, said that a key battle would be fought within the government of South Vietnam. He said Americans had to infiltrate the Saigon government, influence it, “speed up the processes of decision and action” within it — and, if necessary, change it. That job went to Lucien Conein. Conein started working with President Diem’s half-mad brother, Ngo Dinh Nhu, to establish the Strategic Hamlets program, which herded peasants from their villages into armed camps as a defense against communist subversion. Wearing the uniform of a U.S. Army lieutenant colonel, Conein burrowed deep into the decaying military and political culture of South Vietnam. “I was able to go to every province, I was able to talk to unit commanders,” he said. “Some of these people I had known for many years; some I had known even back in World War Two. Some of them were in powerful positions.” His contacts soon became the best the agency had in Vietnam. But there was so much he did not know. On May 7, 1963, the eve of the 2,527th birthday of the Buddha, Conein flew to Hue, where he found a large military entourage whose presence he did not understand. He was encouraged to leave on the next plane. “I wanted to stay,” he remembered. “I wanted to see the celebration of the birthday of Buddha. I wanted to see the boats with the candles lit going down the perfumed river, but it was not to be.” The next morning Diem’s soldiers attacked and killed members of a Buddhist entourage in Hue. “Diem had been out of touch with reality,” Conein said. Diem’s blue-uniformed scouts modeled on the Hitler Youth, his CIA-trained special forces, and his secret police aimed to create a Catholic regime in a Buddhist nation. By oppressing the monks, Diem had made them a powerful political force. Their protests against the government grew for the next five weeks. On June 11, a sixty-six-year-old monk named Quang Duc sat down and set himself ablaze in a Saigon intersection. The pictures of the immolation went around the world. All that was left of him was his heart. Now Diem began raiding the pagodas, killing monks and women and children to sustain his power. Legacy of Ashes took Weiner two years to write. He pored over more than 50,000 documents, mostly from the CIA, White House and State Department archives. The result — an entirely on-the-record narrative, with 154 pages of endnotes — hit The New York Times’ bestseller list as a hardcover in July 2007. Historian Walter Isaacson, former editor of Time, calls it a “fascinating, deeply scary book.” In May, Legacy of Ashes ships out to bookstores in paperback, just ahead of the summer floodtide of suspense novels and bodice-rippers. It’s “the feel-bad book of the summer,” Weiner jokes. In late June and early July 1963, President Kennedy began to talk in private about getting rid of Diem. If it were to be done well, it had best be done in secret. The president began the change of regime by nominating a new American ambassador: the imperious Henry Cabot Lodge, a political rival he had twice defeated, once in the race for senator from Massachusetts and once as Richard Nixon’s running mate. Lodge was happy to accept the job, once assured he would be provided with a viceroy’s powers in Saigon. On the Fourth of July, Lucien Conein received a message from General Tran Van Don, the acting chief of the joint staff of the army of South Vietnam, a man he had known for eighteen years. Meet me at the Caravelle Hotel, the message said. That night, in the smoky, jam-packed basement nightclub at the hotel, General Don confided that the military was preparing to move against Diem. “What will be the American reaction if we go all the way?” Don asked Conein. On August 23, John F. Kennedy gave his answer. He was alone on a rainy Saturday night in Hyannis Port, on crutches for his aching back, grieving for his stillborn son Patrick, buried two weeks before. Shortly after 9 p.m., the president took a call from his national-security aide Michael Forrestal, and without preamble approved an eyes-only cable for the newly arrived Ambassador Lodge drafted by Roger Hilsman at the State Department. “We must face the possibility that Diem himself cannot be preserved,” it told Lodge, and it urged him to “make detailed plans as to how we might bring about Diem’s replacement.” The secretary of state, the secretary of defense, and the director of central intelligence had not been consulted. All three were dubious about a coup against Diem. “I should not have given my consent to it,” the president told himself after the consequences became clear. Yet the order went forward. Hilsman told Helms that the president had ordered Diem ousted. On August 29, his sixth day in Saigon, Lodge cabled Washington: “We are launched on a course from which there is no turning back: the overthrow of the Diem government.” At the White House, Helms listened as the president received that message, approved it, and ordered Lodge to make sure above all that the American role in the coup — Conein’s role — would be concealed. The ambassador resented the agency’s exalted status in Saigon. He wrote in his private journal: “CIA has more money; bigger houses than diplomats; bigger salaries; more weapons; more modern equipment.” He was jealous of the powers held by John Richardson, and he scoffed at the caution the station chief displayed about Conein’s central role in the coup plotting. Lodge decided he wanted a new station chief. So he burned Richardson — “exposed him, and gave his name publicly to the newspapers,” as Bobby Kennedy said in a classified oral history eight months later — by feeding a coldly calculated leak to a journeyman reporter passing through Saigon. The story was a hot scoop. 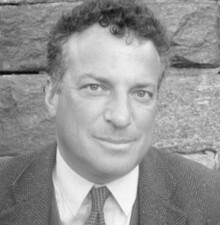 Identifying Richardson by name — an unprecedented breach of security — it said he had “frustrated a plan of action Mr. Lodge brought with him from Washington, because the Agency disagreed with it … One high official here, a man who has devoted most of his life in the service of democracy, likened the CIA’s growth to a malignancy, and added he was not sure even the White House could control it.” The New York Times and The Washington Post picked up the story. Richardson, his career ruined, left Saigon four days later; after a decent interval, Ambassador Lodge moved into his house. Lucien Conein went to meet General Duong Van Minh, known as “Big Minh,” at the Joint General Staff Headquarters in Saigon on October 5. He reported that the general raised the issue of assassination and the question of American support for a new junta. Dave Smith, the new acting station chief, recommended that “we do not set ourselves irrevocably against the assassination plot” — music to Ambassador Lodge’s ears, anathema to [CIA Director John] McCone’s. The White House cabled careful instructions for Conein. Find out the generals’ plans, don’t encourage them, keep a low profile. Too late: the line between espionage and covert action already had been crossed. Conein was far too famous to work undercover; “I had a very high profile in Vietnam,” he said. Everyone who mattered knew exactly who he was and what he represented. They had faith that the CIA’s point man spoke for America. Conein reported back to Lodge that the coup was imminent. The ambassador sent the CIA’s Rufus Phillips to see Diem. They sat in the palace and talked of war and politics. Then “Diem looked at me quizzically and said, ‘Is there going to be a coup against me?’ ” Phillips remembered. The coup struck on November 1. It was noon in Saigon, midnight in Washington. Summoned at home by an emissary from General Don, Conein changed into his uniform and called Rufus Phillips to watch over his wife and infant children. Then he grabbed a .38-caliber revolver and a satchel with about $70,000 in CIA funds, hopped into his Jeep, and rushed through the streets of Saigon to the Joint General Staff headquarters of the army of South Vietnam. The streets were filled with gunfire. The leaders of the coup had closed the airport, cut the city’s telephone lines, stormed central police headquarters, seized the government radio station, and attacked the centers of political power. Conein filed his first report shortly after 2 p.m. Saigon time. He stayed in contact with the CIA station over his Jeep’s secure communications link, describing shellings and bombings and troop movements and political maneuvers as they took place. The station relayed his reports to the White House and the State Department through encoded cables. It was as near to real-time intelligence as could be achieved in that day. “No,” Diem lied. Then he paused, perhaps realizing that Lodge was in on the plot against him. “You have my telephone number,” he said, and the conversation came to an end. Three hours later he and his brother fled to a safe house owned by a Chinese merchant who had financed Diem’s private spy network in Saigon. The villa was equipped with a phone line hooked to the presidential palace, preserving the illusion that he remained at the seat of power. The battle went on all night; close to a hundred Vietnamese died as the rebels stormed the presidential palace. At about 6 a.m., Diem telephoned General Big Minh. The president said he was ready to resign, and the general guaranteed his safety. Diem said he would be waiting at the Saint Francis Xavier church in the Chinese quarter of Saigon. The general sent an armored personnel carrier to fetch Diem and his brother, ordered his personal bodyguard to lead the convoy, and then raised two fingers on his right hand. It was a signal: kill them both. At about 10 a.m., Conein drove back to General Staff headquarters and confronted the first general he met. “Big Minh told me they committed suicide. I looked at him and said, where? He said they were in the Catholic Church in Cholon, and they committed suicide,” Conein said in his classified testimony to the Senate committee investigating the assassination twelve years later. “I think I lost my cool at that point,” Conein said. He was thinking of mortal sin and his eternal soul. From the book Legacy of Ashes: The History of the CIA by Tim Weiner, originally published by Doubleday and available this month in paperback from Anchor Books, divisions of Random House, Inc. Reprinted with permission.